I had the honor of living, traveling and working with William "Green Bar Bill" Hillcourt when I was young. I met Bill Hillcourt much the way countless other kids did: I waited in a long line at the National Jamboree to get a handbook signed (as a gift for my Scoutmaster back home). 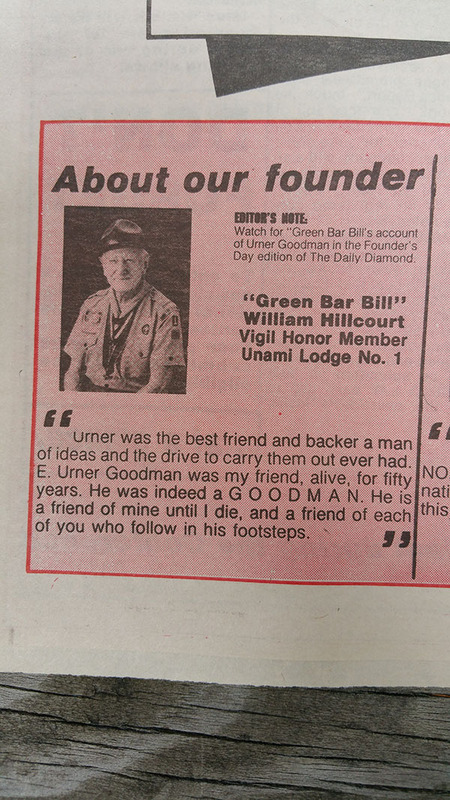 But then, in the lead up to the 75th anniversary NOAC the next year, I reached out to Bill and asked if he wouldn't mind sharing his memories of Urner Goodman for the NOAC newspaper. He agreed, and the back and forth around the article led to a friendship, which then led to one of the great mentoring experiences of my life. Monday, August 22, 1927. That was the first time I met E. Urner Goodman. He was there to meet me at the main railroad station in Chicago where I had just come off the train from Culver, Indiana, Dan Beard's old stamping ground. He was a slim, rather short man â€” 5 feet 7. He was in the full uniform of the professional Scouter, even to the broad-brimmed hat. Urner told me about the kind of life he had led in Pennsylvania: born on May 15, 1891, into a deeply religious family, he was baptized into the Presbyterian faith. When he was growing into boyhood, he had a fortunate experience: he found out that his church had a Boys Brotherhood for more than half a century. He joined it. As he grew older, he eventually became the superintendent of that Brotherhood. These experiences convinced him that he should throw his life into the teaching of youth. So, he entered the Philadelphia School of Pedagogy to learn the teaching profession. He was firmly convicted that this was IT â€” teaching was to be his life work. He was the commencement speaker at his graduation from the school. His topic was "The Call to Teachâ€. 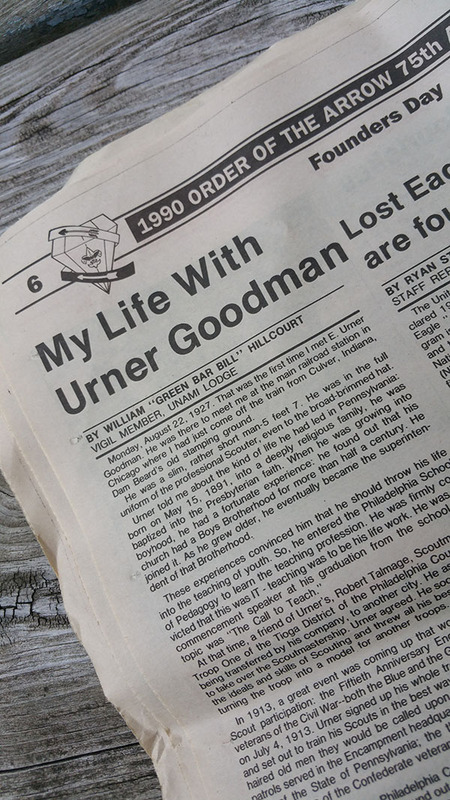 At that time, a friend of Urner's, Robert Talmage, Scoutmaster of Troop One of the Tioga District of the Philadelphia Council, was being transferred by his company, to another city. He asked Urner to take over the Scoutmastership. Urner agreed. He soon picked up the ideas and skills of Scouting and threw all his best efforts into turning the troop into a model for other troops. In 1913, a great event was coming up that would involve Boy Scout participation: the Fiftieth Anniversary Encampment of the veterans of the Civil War â€”- both the Blue and the Grey â€” at Gettysburg on July 4, 1913. Urner signed up his whole troop for participation and set out to train his Scouts in the best way of helping the greyhaired old men they would be called upon to assist. Two of his patrols served in the Encampment headquarters under the supervision of the State of Pennsylvania; the third was on duty at the headquarters of the Confederate veterans. The president of the Philadelphia Council, Dr. D. C. Hart, was a distinguished M.D. He had found out that there was a Scoutmaster in North Philadelphia who was doing all kinds of "outlandish" things with his Scouts. Cowing called in the Scoutmaster, E. Urner Goodman, and had a long talk with him about his troop activities and about Scouting in general. After Urner had left, Cowing called and told Dr. Hart about the long conversation he had had. He finished by saying,"We need more Scoutmasters with vigor like Urner's. He is my kind of man. In early 1915, Cowing called in the Scoutmaster of Troop One for another reason: he asked Urner to take on the job of Camp Director for the Treasure Island camp for the summer. He would have for his assistant Carroll A. Edson, already a member of the Philadelphia Council Staff. Urner accepted. The two Scouters sat down to prepare for the camping season, Goodman the program-oriented member of the team, Edson the organizer. When camping with Troop One, Goodman had used many of the camp activities that were so vividly and humorously described in The Boys Book of Camping by Edward Cave, the editor of Boy's Life, a new magazine for boys that had just begun to appear. Urner had been particularly struck by Cave's description of a contest in which the winners would join a"clan" -- a contest with so much appeal and tradition"that half of the troop would strive for membership in the clan for the ensuing year. That would be a goal worth striving for. Edson had taken off in another direction. He had been under the influence of Ernest Thompson Seton's booklets, the Birch Bark Rolls. He was fascinated by the way Seton had used age-old Indian handicrafts and traditions to develop his boy program of â€œWoodcraft Indiansâ€. Edson set out to find out more about the lore and crafts and traditions of the indians who had inhabited the area in which Treasure Island was located â€” "The Land of the Lenni Lenapesâ€. He had help from Harace W."Shorty" Rolston, an old time Philadelphia Scouter who had joined in the planning and had located an old Lenni Lenape--English Dictionary put together by Moravian missionaries who had worked with with the Indians of the Unami sub-tribe. The two Scouters searched through the volume for a suitable name for Urner's "clan." 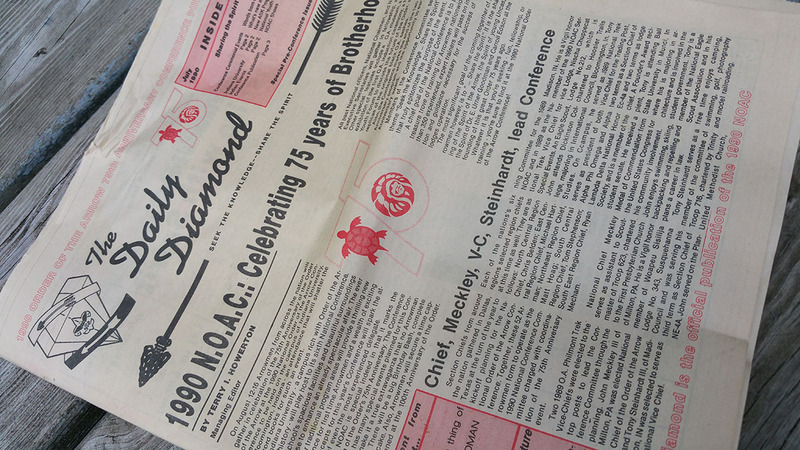 They found it :"Wimachtendienkâ€â€” Lenni Lenape word for "Brotherhoodâ€. Thanks Terry. I wish I still had my old footlocker...but it never contained anything like what you just shared. Scout Salute! Thanks for sharing that Terry.